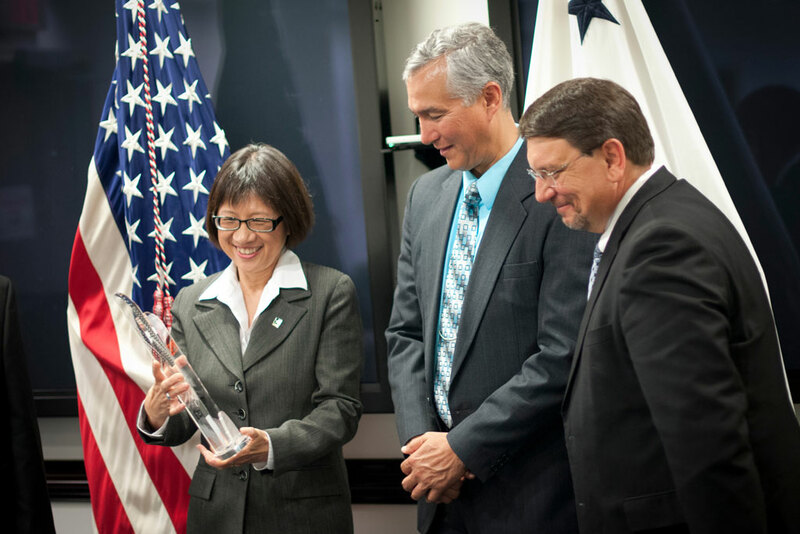 ARLINGTON, Va. (April 30, 2013) — The U.S. Army has been named one of the world’s most innovative research organizations, after earning more than 300 patents for new technologies in a three-year period. The Army joins the ranks of private companies such as 3M, Apple, AT&T, Dow Chemical, DuPont and General Electric as one of the 2012 Top100 Global Innovators named by Thomson Reuters, the multimedia and information conglomerate. The U.S. Navy was also named, making the two service branches the first government agencies to make the list. The award focused on all organizations having 100 or more “innovative” patents, defined as the first publication in a patent document of a new technology, from 2009-2011. Thomson Reuters then used its proprietary methodology to measure the organizations’ success on a variety of metrics, such as “influence” — how often their research was cited by other innovators in their subsequent inventions — and “success,” the conversion rate of patent applications to granted patents. The Army scored well in both of those categories, with more than 8,500 citations of its inventions published from 2007-2011, and 327 granted patents out of 436 published inventions from 2009-2011. The service also stood out for the broad range of subject matter covered in its inventions portfolio, ranging from training software that uses virtual robots to dispose of simulated explosives, to a folding shield that protects the operator of a tank weapon station, to a vaccine guarding against infection by the Ebola virus. The U.S. Army has been named one of the 2012 Top100 Global Innovators by Thomson Reuters, the multimedia and information conglomerate. 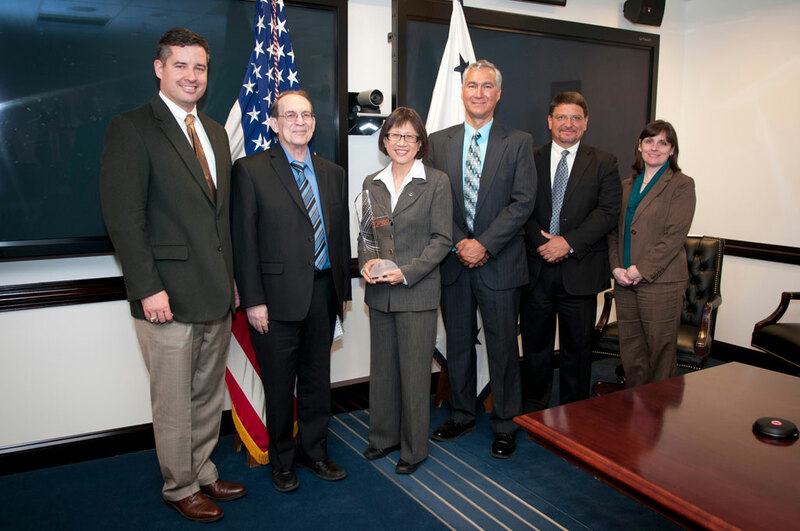 Pictured with the award are Mr. Dale A. Ormond, Director of the Army Research, Development and Engineering Command (RDECOM); Mr. Ronald E. Meyers of the Army Research Laboratory; Ms. Heidi Shyu, Assistant Secretary of the Army for Acquisition, Logistics and Technology (ASA(ALT)); Mr. John E. Nettleton of the Communications-Electronics Research, Development and Engineering Center; Mr. Bartley Durst of the Engineer Research and Development Center (Corps of Engineers); and Ms. Mary Miller, Deputy Assistant Secretary of the Army for Research and Technology. More than 900 individuals contributed to the Army’s patents, including personnel from RDECOM, the Army Corps of Engineers and the Army Medical Research and Materiel Command, as well as some of their partners from industry, government and academia. Three of those individuals, representing all the Army innovators, were honored at the award ceremony, including Ronald E. Meyers of the Army Research Laboratory, who was the top innovator with 11 patents; John E. Nettleton of the Communications-Electronics Research, Development and Engineering Center; and Bartley P. Durst of the Engineer Research and Development Center, Corps of Engineers. The recognition by Thomson Reuters illustrates the depth, skill and dedication of the Army science and technology community and the impact of their efforts both within and beyond the military, leaders said. In a constrained budget environment, deliberate investment in science and technology is essential to drive continued innovation, Shyu said. The Army is developing a strategic plan that will protect and facilitate science and technology efforts that are essential to Army modernization, addressing the state of emerging and evolving threats; trends in commercial technology; current and emerging equipment requirements; and research in core priorities that address Army-unique challenges. While it is difficult to predict future technology developments, leaders expressed confidence in the Army workforce to continue accelerating innovation to give Soldiers the decisive edge.